This executive vacation rental home has a double garage, which has been completely refurbished and converted into a fantastic GAMES ROOM. An 8' Pool Table, Air Hockey and Soccer Table have been installed to provide hours of entertainment and challenges for everyone !! 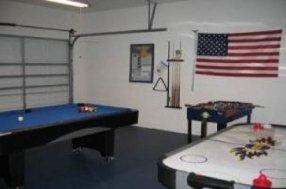 The superb Games Room, TV's in all bedrooms & the large swimming pool all add to many happy memories of a great Florida vacation. 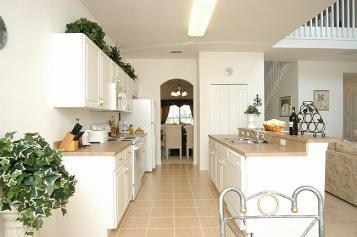 This vacation home has a large FAMILY ROOM with double-height cathedral ceiling, which is a real showpiece. This open-plan area looks out onto the lanai, pool deck and lake beyond. This luxurious room is overlooked by a unique sky-bridge and has a ceiling fan for complete comfort. A large screen, multi-channel American cable TV and Blueray player is installed in the lounge and there are a further 5 TV's in all bedrooms. In addition this luxury villa has a selection of music, books and games for you to enjoy, ensuring all guests have a memorable Florida vacation. This luxury 5 bedroom villa has a spacious open plan fully equipped KITCHEN with oven, hob, microwave, dishwasher, American fridge/freezer/icemaker and double sink, together with all the necessary kitchen equipment to make it feel like home. 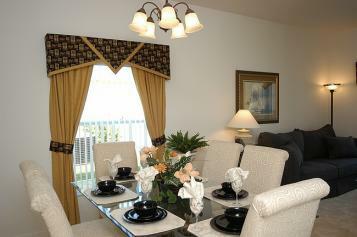 Adjacent is a BREAKFAST NOOK with seating for four, overlooking the pool area and there is also a breakfast bar. A washing machine, tumble drier, iron and ironing board are housed in a separate utility room. All linen and towels are provided for your convenience. An additional HALF BATHROOM for general use is situated downstairs. The separate executive DINING AREA has a stunning column support glass table seating six people. This really is a magnificent setting for formal dining and should you wish to escape somewhere quieter, there is a SECOND LOUNGE AREA with double sofabed, an additional sofa and a large glass coffee table. This lies beyond the dining area for extra privacy. THE MASTER BEDROOM at this vacation rental really is something to behold! It is the ultimate in privacy and luxury. Accessed by it's own gallery walkway, it occupies the whole of the East side of the first floor. It is fully furnished with a King-size mahogany 'antique' feature bed, dressing table and nightstands. It has patio doors leading onto its own spectacular balcony which overlooks the pool and conservation area beyond. Villamagic has a luxurious EN-SUITE BATHROOM with two single bowl vanity units, a toilet (separated from the remainder of the bathroom by its own door), a large roman bath and a huge walk-in shower cubicle. Also in the bathroom area are two large walk-in closets. THE DEN upstairs really is one of the stars of the show. 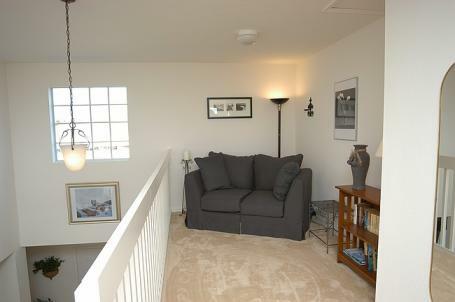 On the large landing a comfortable sofa, coffee table and reading lamp provide an ideal place for quiet relaxation. This tranquil area is adjacent to the impressive Sky-bridge, which overlooks the family room and kitchen area, with far-reaching views beyond. Enjoy the Florida sunshine & conservation views from both floors of this executive rental. You could also use this area to log onto the high speed WIRELESS INTERNET ACCESS now provided free of charge at Villamagic. MASTER BEDROOM 2 on the ground floor is again fully furnished with a Queen-size feature bed. Patio doors running the length of the room give you your own personal access to the deck and pool area. This bedroom also has its own EN-SUITE with an annexed door. 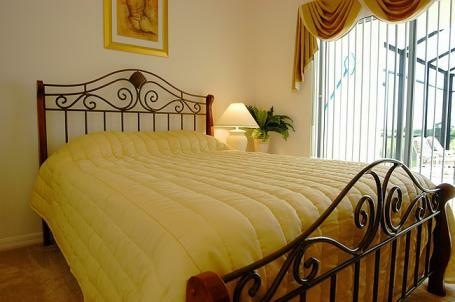 A hairdryer, radio alarm clock and remote control television are available in both master bedrooms. BEDROOM 3 contains a luxurious teak Queen-size feature bed. It is equipped with it's own remote control TV and is fully furnished to a very high standard, overlooking the conservation area. It shares a family bathroom with one other bedroom. There are a further TWO TWIN BEDROOMS, that the kids or young at heart will love. One has a Disney theme, whilst the other is themed in American sports. Both these rooms are equipped with a remote control TV. 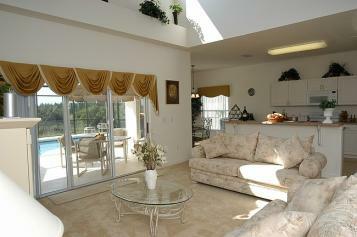 If you want a really special Florida vacation then choose Villamagic ~ your luxury 5 bedroom villa in Orlando Florida!